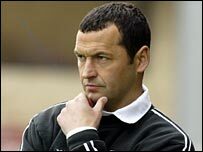 11 | February | 2008 | Through the seasons before us..
A fly on the wall for the half time team-talk? Courtesy of Stress and Pie – this made me chuckle away a good portion of my lunch break, much to the consternation of my colleagues when I tried to explain it! Worked wonders for lightening my mood, then making me feel annoyed again because it’s probably not all that far removed from what really happens! Still, enjoy! Smoulds lays into home fans.. The Mexican stand-off between Smoulderwood and the fans looks set to rumble on, after the manager decided to criticise the support levels in his post-match comments at the weekend. Whilst I do have some sympathy with his sentiments, I do think he’s unwise to ruffle feathers any more than he need to right now, with many supporters teetering on the brink of whether they want to back his tenure or not. So whilst he’s talking a lot of sense, it’s an ill-advised move for him to be critical of fans who have never been particularly famed for generating a cauldron of noise. Brian Clough criticised it, and he was within his right to, he was producing wonderful football and delivering silverware. Smoulderwood is delivering neither, despite having what most fans agree is a squad capable of producing the goods at this level. If you want vocal backing, Smoulders, then you need to send the team out to attack from the off – but you will never get the kind of vocal backing you get away from home (which is odd, as generally the performances are worse away from home!). While you’re at it, you might want to consider lobbying the powers-that-be to move the away fans from the loudest bit of the ground – put a bit of unreserved seating down in the Lower Bridgford for supporters who want to chant – you’ll notice the difference. So I do have some sympathy with him, it infuriates me when there is booing at half time, I often wish we could have more atmosphere at home matches, I wish that our fans came up with more imaginative chants – but the fact is, a combination of dour football, the wider contribution of all-seater stadia and ridiculously draconian stewarding and general malaise makes this unlikely. However underpinning all that, it’s generally a bad idea for a manager to bad-mouth his fans when they turn up in their thousands at this level of football – to generally watch a standard of play that is below the capabilities of our resources and players. If you want to do something realistic to help the fans back the team, Smoulds, then have a word with the security teams who patrol the fans – I’ve known people banned for 3 games for the heinous crime of standing up and singing a song to back the team.